The main point of which will be to have people in and around F1 and top level Motorsport – on what changes would improve F1 for the better. Before I start asking the people who actually know what they’re talking about, I thought I’d start with Chapter 1 of what I’m loosely phrasing as my F1 manifesto. The knowledgable contributors are coming up over the weeks, and interspersing that will be my ramblings. 1992 remains the most exciting race I can remember. And not because it was full of amazing overtakes. I remember the race more for the overtake that didn’t happen and the skill involved in stopping the overtake. F1 is the pinnacle of single seater Motorsport, and the Senna Mansell tussle showed the very best of two fantastic drivers absolutely going at it. There was no outrage at the blocking, no accusations of reckless behaviour. F1 shouldn’t be the easiest place to overtake, it should be the place that the best racers find ways to get around slower cars – or not. Which is why I have such reservations about the DRS system and the artificial boost to overtaking it produces. I’m not against providing drivers with potential assistance, but it should come at a price. Who really wants to see cars passing in a defined passing zone – no thanks…. There are a number of things that could be done to reinstate a premium on overtaking skills. > No more DRS – remove this artificial advantage and speed differential without any potential downside. > Turbo boost flexibility – let teams play roulette with an engine in 2014. So if Ferrari want the Monza win, and are willing to jeopardise an engines life to do so (or a blown engine) – let them do it. Therefore you introduce the reward, but also a risk. And you mix it up a bit. And if Lewis gets stuck behind a car, he can give it full boost and really have a bloody good go. > Let backmarkers race – there should be a premium on overtaking skill, as there was years ago, no an automatic entitlement for quicker cars to get past. The number of times you see a backmarker seem to have to pull off into the marbles just so they aren’t seen to ‘spoil the show’ is incredible. If you’re good enough to get to F1, you should be good enough to earn a place without being handed it on a plate. > Remove mandated tyre usage in races – the compulsory use of both compounds is another artificial interference. A team should be able to pick how many tyres to use, when to use them and when not to. Such a move would allow for the classic rabbit and hare scenario where someone could take a big risk on tyres and an extra stop and push really hard, whilst another could go for a 1 stopper. Therefore there is a natural speed differential in the strategy. > Penalties for weaving – I’ve often wondered what Senna might have made of the current trend of not being allowed to place your car more than once. 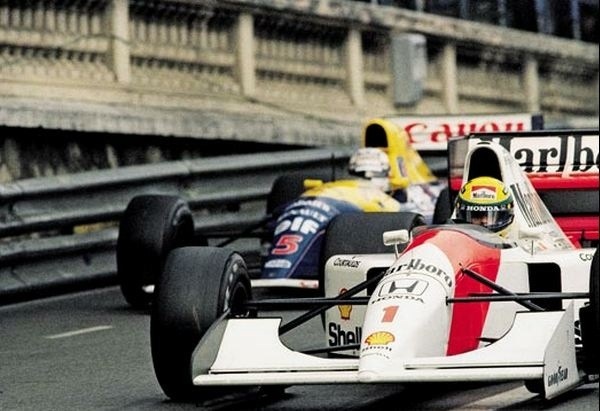 That great 1992 Monaco finish would not be allowed nowadays as Senna would have been reprimanded heavily for simply doing what is natural – defensive driving. The driver in front uses every tactic he’s got to safely keep the other driver behind him. And the guy behind tries every move he has to get past. And if he can’t, he shakes his competitors hand and tries again next week. Surely it can actually be that simple in F1. I’d be really interested to know your thoughts and ideas. Chapter 2 coming up next week….